If you’re a homebody, you need a sofa and loveseat set that will keep you comfortable throughout endless movie marathons and hours of reading. 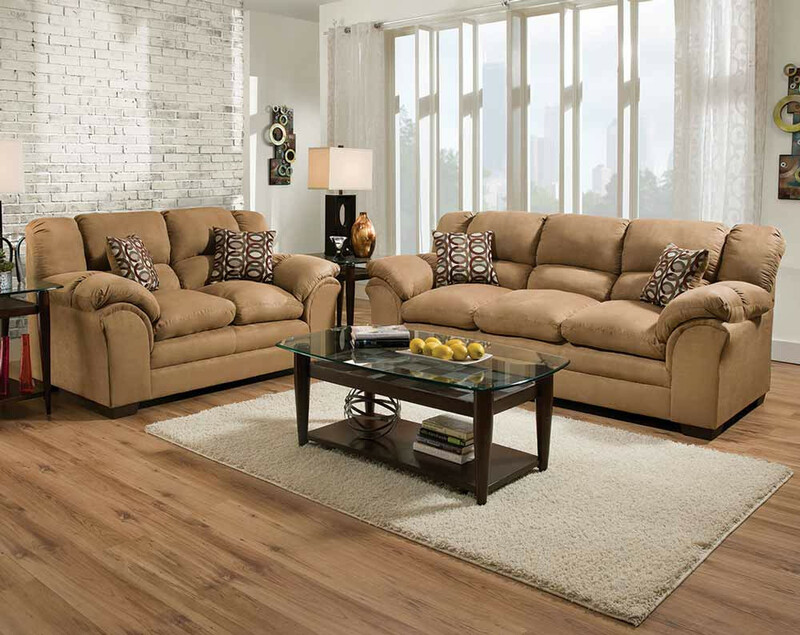 The Sierra Camel Sofa and Loveseat from American Freight Furniture and Mattress is an excellent choice. The Sierra Camel Sofa and Loveseat will upgrade your living room furniture in an instant. The camel color is easy to blend with neutral tones like brown and gray. Both pieces of the set have an oversized look. From the waterfall back cushions to the arms, each section of the sofa and loveseat set are plush and padded. The camel colored couch set comes in a suede fabric. It’s soft and easy to spot clean. The matching geometric throw pillows are burgundy, camel, gray, and cream. 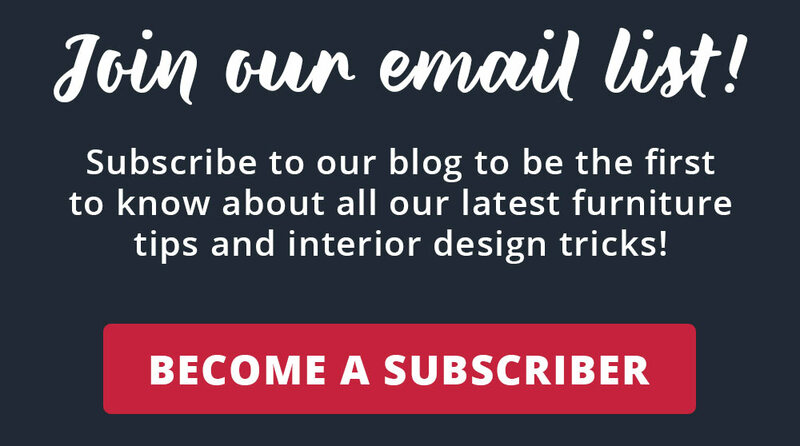 Don’t settle for discount sofas and loveseats that look good but don’t feel comfortable. 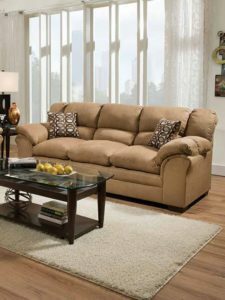 If you’re shopping for couch and loveseat sets for cheap for your main living space, consider the Sierra Camel Sofa and Loveseat. This set looks great for entertaining. Your guests will feel right at home when they sit down to visit. Plus, the sofa and loveseat are suitable for the whole family. Up to five adults can sit comfortably on this fabric loveseat and matching sofa. Camel is a color that never goes out of style. From a minimalist sage green and white living room to a traditional navy blue entertainment den, there are few colors and styles that won’t match the Sierra Camel Sofa and Loveseat. This monochromatic sofa and loveseat set won’t compete with any patterns or colors in your room. If you have pets, camel is a sneaky color that will hide evidence of pet hair. Unlike black or white couches that show every single piece of hair, you won’t notice any on the Sierra Camel Sofa and Loveseat. Choose a camel sofa so that you don’t have to commit to other colors. One minute you can have scarlet accent pillows and the next you could swap them for a charcoal fuzzy blanket. If you love to switch your living room furniture theme like the seasons, choose a camel couch that will match everything! We make it easy to find couch and loveseat sets for cheap. To view the Sierra Camel Sofa and Loveseat and other sofa sets for sale from American Freight Furniture and Mattress, click here. You can also stop by your nearest location to try before you buy. Click here to find the store closest to you. 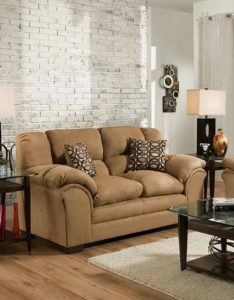 We also carry the Sierra Chocolate Sofa and Loveseat. American Freight Furniture and Mattress offers same-day delivery on all in-stock items as well as free layaway. Ask a store associate about our low easy payments and how you can take home the Sierra Camel Sofa and Loveseat for only $50! Check out this great informational video about the Sierra Camel!